WINNER - BEST IN SHOW! 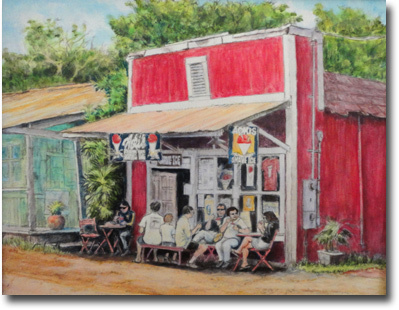 Showing of Mark N. Brown paintings at Assagio's restaurant in Kailua at Uluniu st. (View Map). Mark is one of the few Plein Air Artists in Hawaii. Plein Air artists paint their paintings entirely outside at the site of the painting subject. He teaches this method at the University of Hawaii and his work can be seen all throughout the Hawaiian islands. This oil painting was donated by Hawaii Artist Mark N. Brown. 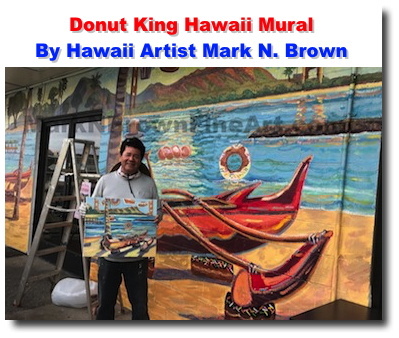 Mark N. Brown offers wall murals services for homes, businesses, churches, schools, restaurants and kids rooms and more by Hawaii Artist Mark N. Brown. Indoor and Outdoor. 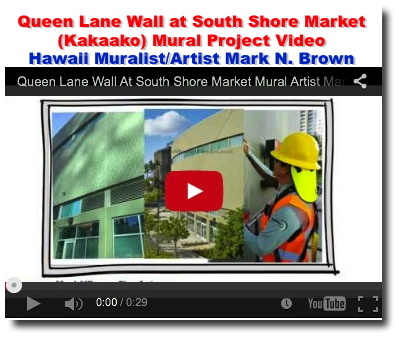 - View gallery of recent mural projects in Hawaii. I remember a lot about art lessons with Mark and all the amazing people I met because of his plein air classes. My favorite story of Mark was calling him mid-week to see if he was out painting so I could join him. He said I'm at Kapiolani park. I said mark, that's a huge park, where are you exactly' and he said that it would be easy to find him. I was skeptical but drove down the road and there he was with two full door boards on big metal stands and he was literally skipping in front of them ,painting them. His laughter and silliness along with his knowledge and gentle coaching has made learning landscape painting the most lovely experience of Aloha I could have imagined and also the most informative !! Mark, thank you so very very much for the wealth of knowledge you shared and your fabulous critiques and genuine Aloha. 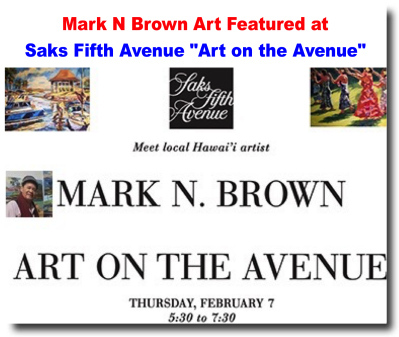 Hawaii Artist Mark N. Brown conducts a live art paint Downtown - Chinatown - Honolulu. View photos and finish work of art! 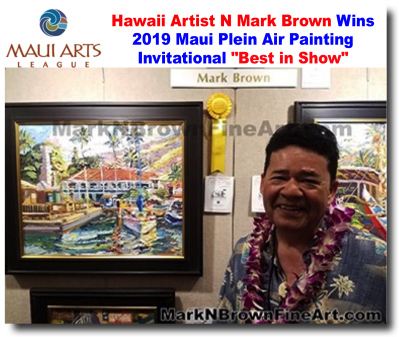 3/2/2019 - Hawaii Artist N Mark Brown Wins 2019 Maui Plein Air Painting Invitational "Best in Show"
Artist Mark Brown s 20" x 24" oil painting, "Stars &Stripes Over Lahaina" won "Best in Show" among 96 entries by 23 nationally acclaimed outdoor landscape artists from Hawai i, the mainland and Australia. The 2019 Maui Plein Air Painting Invitational award show was judged by Jean Stern, Director, The Irvine Museum Collection of University of California Irvine Museum and Institute of California Art. 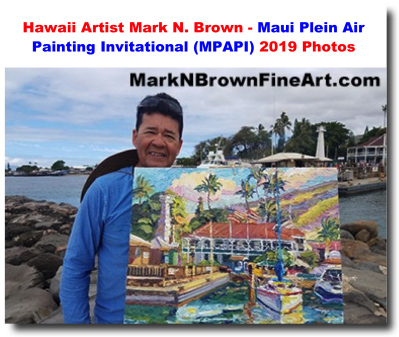 3/1/2019 - Hawaii Artist Mark N. Brown - Maui Plein Air Painting Invitational (MPAPI) 2019 Photos - WINNER - BEST IN SHOW! 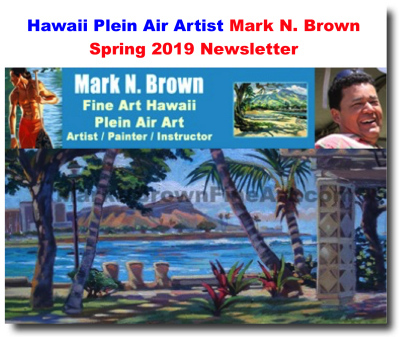 Mark N. Brown is proud to be selected to represent Oahu at the world renown Maui Plein Air Painting Invitational (MPAPI) 2019 event and win 'Best in Show" honors. This is quite an honor for Mark as he represented the heart, spirit, and aloha of Hawaii. 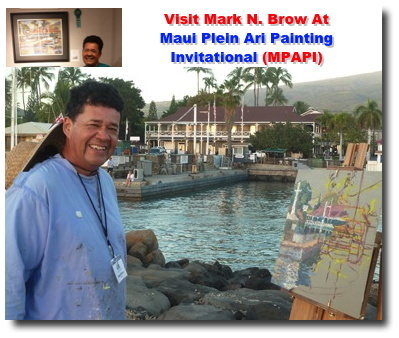 Mark N. Brown is proud to be selected to represent Oahu at the world renown Maui Plein Air Painting Invitational (MPAPI) event. The Maui Plein Air Painting Invitational (MPAPI) is a week long art event in Lahaina on Maui, Hawaii. It is always held the week including President's Day. The annual event will be held February 17 through Sunday, February 25. 2018. Annual Parade in Lanikai, Hawaii. Hawaii Artist Mark N. Brown is proud to donated artwork to support this project/event. Come see Mark N Brown perform live painting at Harry Winston at Ala Moana Shopping Center - December 29th, 2018 - January 2nd, 2019 2pm to 6pm. Since 1932, Harry Winston has transformed diamonds into art and revolutionized modern jewelry and watch design. Mark N Brown perform live painting at Harry Winston at Ala Moana Shopping Center - December 29th, 2018 - January 2nd, 2019 2pm to 6pm. Since 1932, Harry Winston has transformed diamonds into art and revolutionized modern jewelry and watch design. 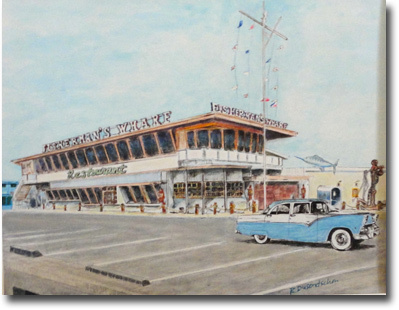 Mark had a great time and sold all 3 paintings he painted including a restaurant scenet. The event was sponsored by the Maui Arts. Come see Mark N Brown perform live painting at Magnolia at Kahala Mall. Magnolia carries an exceptional handpicked selection of antique and vintage furniture and art. Mark is proud to have 10+ Hawaii art images feature at the Punahou School Carnival Art Gallery. Stop by and see great art available for the community. We have updated out student suppy page. What you need to bring to our art classes. In support of the Hawai'i Appleseed Center for Law & Economic Justice and its anti-hunger work Presenting the Good Apple Award to Chris Hecht & Kona Pacific Charter School. The evening includes dinner, wine, and the work of local artists, which will be displayed and offered for sale. Mark is one of the few Plein Air Artists in Hawaii. Plein Air artists paint their paintings entirely outside at the site of the painting subject. He teaches this method at the University of Hawaii and his work can be seen all throughout the Hawaiian islands. Painting Party Fundraiser October 1, 2017 2pm-5pm, At Sherree Mckellar's Kailua Beach Studio. 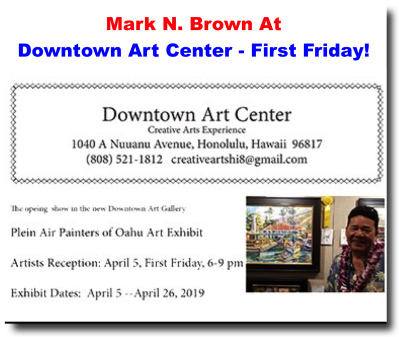 Featuring Hawaii Artists: Mark Brown, Rebecca Snow And Patrick Ching. Multiple art classes. Special Plein Air Painting In Chinatown - Honolulu, Hawaii. AUGUST 12, 2017 - Saturday 8:00 a.m. The Hale'iwa Arts Festival - 20th Annual Haleiwa Arts Festival July 15-16 2017. Haleiwa Beach Park Visual and Performing artists. Food,fun keiki activities and its Free! The Hale'iwa Arts Festival event activities include approximately 125 juried visual artists with original works and limited editions, both traditional and contemporary, in oil, acrylic, ceramic, photography, sculpture, watercolor, fabric, serigraphy, jewelry and glass, as well as other media. Their art will be available for viewing, browsing and purchase directly from the artists. View samples of the 40+ images available at Hale'iwa Arts Festival. Priced to sale! - Great way to own a Mark N. Brown Original. This oil painting was donated to the Make A Wish by Hawaii Artist Mark N. Brown. I have totally enjoyed the experience of Mark Brown's plein air (painting outside) class. Upon retiring to Oahu I looked for other outside activities in addition to golfing and walking on Kailua beach. 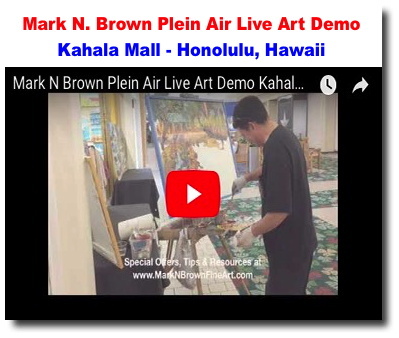 After taking watercolor painting and acrylic painting through the Honolulu Museum of Art School, I was introduced to Mark Brown and the plein air journey began. I joined his Saturday morning class and began oil painting at different locations around the island. So in addition to learning how to paint outside with oil paint/easel, we visit the most beautiful sites on the island. It just doesn't get any better than painting at a botanical garden, a historical site, or on a windy, sunny, beach with sand blowing onto your painting. It is so much fun that I also paint outside on Tuesdays and sometimes Thursdays. Mark starts his Saturday class with a one-hour demonstration of painting on site. He is a fantastic painter/teacher and inspires and motivates both the novice and experienced painter. His demonstration of technique and nuggets of information are interspersed with a great sense of humor. This will be my third year of attending the class and others have taken it even longer. It is not only a class but a gathering of friends and colleagues which make the experience especially rewarding. Many attendees now participate in art shows and sell their paintings. If you want to have fun and a great experience with plein air painting, Mark Brown's class is for you. I have just signed up for Mark Brown's 2017 Summer painting class, and wanted to re-state my gratitude and excitement for being able to continue my on-going education under Mark's knowledgeable and entertaining direction. As a returning student (I've lost track of how many years I've been in his class), not only do I continue to learn useful techniques for both acrylic and oil painting (and drawing as well), but I also enjoy hearing about Mark's adventures that he experiences as a dedicated, full-time professional artist. His love of Hawaii and his passion for depicting it's beauty and uniqueness is truly inspiring. His enthusiasm is infectious and he has attracted a group of perennial students like myself who have signed up for his classes year after year. I look forward to every class with great anticipation and wouldn't know what to do with myself if I didn't have those Saturday morning plein air painting expeditions. I was so grateful to be able to participate in the au plain air classes. I have owned several of your paintings and have admired your work for the past 16 years that I have moved to Hawaii. It was such an honor and privilege to have you as a teacher and be in such an inspiring class. It is a dream come true in my retirement. The class is such a positive learning environment and the students are also so supportive. I look forward to learning more with each class. Thanks for the encouragement to pursue my dream. Cheryl Bennett-former Kamehameha art teacher. Plein air painting is truly painting from life. Living moving changing light could be daunting. Mark Brown makes it doable. He chooses locations and shows how to select a composition. He then demonstrates creating the composition while describing choices in , color, value. Going from student to student He has special ability to know just what information and guidance to give each person as needed in their level. Talented painter, gifted teacher he is kind,caring, respectful and professional. Mark has created an atmosphere of camaraderie and friendship. I have seen tremendous growth in those students who regularly attend Mark's class for he has given them the tools to bring out their individual essence. Mark Brown is a true Hawaii treasure. 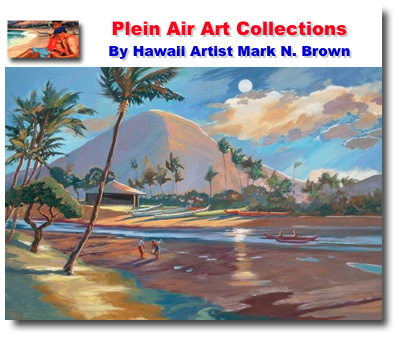 4/1/2017 - Hawaii Art - Mark N. Brown Launches Master Page of Hawaii Plein Air Art Collections. 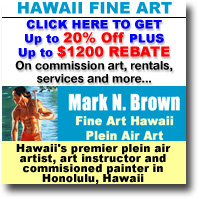 View Hawaii Artist Mark N. Brown plein air art collections. Groups if plein air art painting by category. Waikiki collection, Chinatown collection, etc. 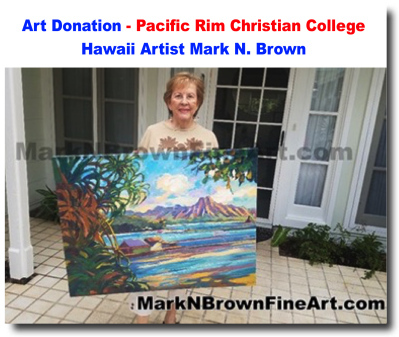 Video of beautiful new Hawaii art originals for sale by renown Hawaii artist Mark N. Brown. 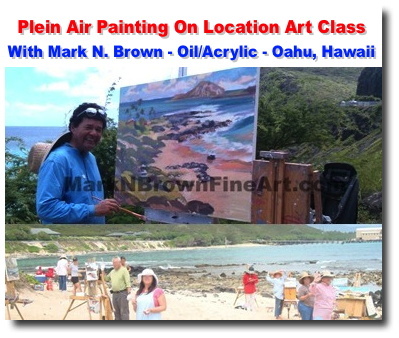 Plein Air artist Mark N. Brown is one of the few painters in Hawaii whose oil paintings are entirely painted outdoors. 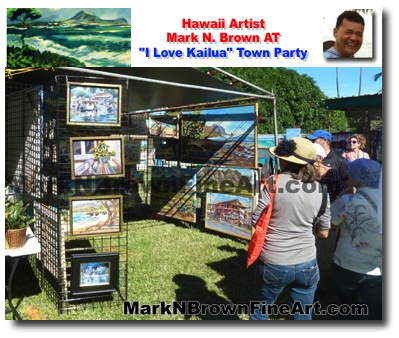 This unique art technique along with his eye for capturing Hawaii's lovely landscapes makes Mark N. Brown's artworks a great choice for any corporate or business environment. Mark Brown loves Plein Air painting. 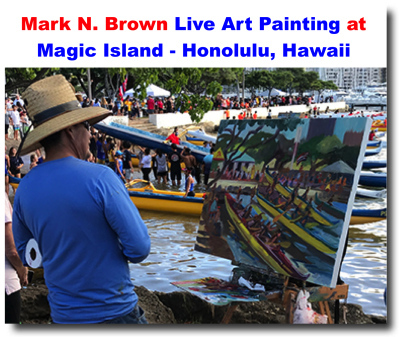 View multiple photo of Hawaii artist Mark N. Brown in action. This 36"x36" oil painting was donated to the Oahu SPCA by Hawaii Artist Mark N. Brown. Auction took place on Sept. 4th, 2016 and raised $1600 for Oahu SPCA. Photos of the winning bidder at $1800 for the Kailua Beach Painting Mark did a couple days before the Woe's Day Parade. Also featured is from San Francisco who won with a bid of $ 450 for the live jazz painting. Mark N. Brown is proud to be selected to represent Oahu at the world renown Maui Plein Air Painting Invitational (MPAPI) event. The Maui Plein Air Painting Invitational (MPAPI) is a week long art event in Lahaina on Maui, Hawaii. It is always held the week including President's Day. The 12th annual event will be held Saturday, February 18 through Sunday, February 26. 2017. Mark recently hung some paintings in the Ko'olani listing with Aloha staged interiors�as the stager and Charene Davis as the listing agent. A good video showing the interior with Mark's paintings and the potential of good artwork can do for the property . View photos of Hawaii Artist Mark N. Brown Chinatown Plein Air Art Exhibit. Featuring great artwork of the Downtown-Chinatown, Honolulu area. 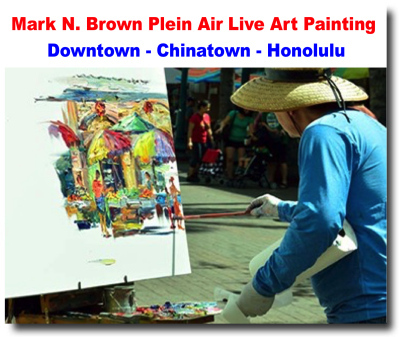 Hawaii Artist Mark N. Brown Plein Air Painting in Chinatown (Honolulu, Hawaii) photos. Instruction by renowned Hawaii Artist Mark Brown. Stay in our beachfront lodge rooms! Enjoy delicious fresh meals in our ocean view Dining Hall! Meet talented Hawaiian mural artists! Relax with yoga instruction, beach walks, nature trails, & labyrinths! Mark is proud to have multiple Hawaii art images feature at the Punahou School Carnival Art Gallery. Stop by and see great art available for the community. Ref. No. : 28560 ** Price: $6000 ** Size: 48x60 ** Inspiration: This painting gave me a chance to capture a sense of place with Diamond Head and a lifestyle painting with the surfers, joggers, bikers, and swimmers who would walk the scene. I started the painting in the morning and took a lunch break then came back and worked into the afternoon and evening. I took the sunset colors and put them in the sky. During the summer there was more activity with the people in the evening. It was awesome! Ref. No. : 28561 ** Price: $2400 ** Size: 36x36 ** Inspiration: Skilled Hawaiian chanters. Ref. No. : 28563 ** Price: $2800 ** Size: 48x36 ** Inspiration: A very special place Mark love to paint. Ref. No. : 28564 ** Price: $2800 ** Size: 36x48 ** Inspiration: A painting that shows the multi ethic race that make up the Hula troupe. I enjoy the figure as I have been drawing from the figure since High school. It's time to revisit this series. Ref. No. : 28565 ** Price: $5000 ** Size: 48x60 ** Inspiration: "Kalama Beach" is a spot where I learned to body surf. It was a time when my younger brother Kent (who is now a Lifeguard) and I would our fins, catch the bus and hope for good surf. We didn't need anything big, we were happy with a 2 feet set but it did get larger. Then we graduated to Bellows Beach. Ref. No. : 28566 ** Price: $2800 ** Size: 36x48 ** Inspiration: Inspired by the strong breaks overlooking Makapu'u Beach in Waimanalo. Ref. No. : 28567 ** Price: $2600 ** Size: 30x40 ** Inspiration: I did the painting of the Punahou School Chapel on location at the Manoa campus. I have done several versions of this and the most fun I had doing it was when I did a demo for the Rainbow and Koi class (Kindegarten and 1st graders). On many occasions, he has donated his time and artwork to many deserving individuals and wonderful causes including the MDA (Muscular Dystrophy Association), American Heart Association/American Stroke Association, Friends of Kewalos, Hawaii Theater, IHS and more! View a list of testimonials from happy Mark N. Brown clients, art collectors and students. There are currently several houses in the market that are showcasing Mark N. Brown's original work. Want to learn more about Hawaii Plein Air artist Mark N. Brown? Check out his media page. Mark's unique art technique and wonderful artworks has constantly drawn the attention of the local, national and even international media! Hawaii Plein Air artist Mark N. Brown has had the pleasure of watching many hula performances and sometimes, he even captures the beauty of the dancer's movements, costumes and message through his artwork. Great article to learn about the mural. While the canvass is smaller in size, the stunning visuals of the landscape he chooses is by no means diminished. From Hawaii to Seattle to Europe and beyond, Plein Air artist Mark N. Brown has created an amazing array of artworks as he paints on location. Pictured is Camp Mokulē‘ia executive director, David Turner, with Mark N. Brown painting of Haleiwa Beach Park, which was done for a live auction. The funds raised benefit kids at camp who cannot afford to attend camp. The event was held on November 2016. Mark, I am enjoying gazing at your beautiful paintings! I have them proudly and happily hanging on my living room wall. Next Summer they will be moved to my mountain home in the Sierra Nevadas. Come and learn Plein Air Art from on of Hawaii's premier Plein Air artists, Mark N. Brown! Every Tuesday Mark offers outdoor Plein Air art classes at different locations all over Hawaii. This is a great way to be inspired by Hawaii's lovely outdoors and learn a unique art technique. Sign up for Mark N. Brown's Outdoor Plein Air Art Workshops below. Fronting Nimitz Highway, this large scale mural covered the building's facade with images of kukui nuts and leaves and yellow and orange hibiscus flowers. There are also metal plates representing the Koolau range and school of aku fish swimming. Hawaii's iconic Diamond Head over a sunset is also depicted in the mural. 8/1/2016 - What is Plein Air Art? "En plein air" is a French expression which means "in the open air", and is particularly used to describe the act of painting in the outside environment rather than indoors (such as in a studio). The Hale'iwa Arts Festival - 19th Annual Haleiwa Arts Festival July 16-17 2016. Haleiwa Beach Park Visual and Performing artists. Food,fun keiki activities and its Free! If you've been dreaming of owning a Mark N. Brown original artwork, now is a great time to take advantage of our online rebate and discount offers! Mark Brown is proud to be a supporter of Friends of Kewalos 2016 beach cleanup. Friends of Kewalos is a 501(c)(3) non profit organization comprised of recreational users of the Kewalo Basin Park area in Kakaako - Honolulu, Hawaii. Artist's Statement - I enjoy painting outdoors because it limits the amount of time that I have to capture the light in my painting. It makes me call attention to the most important elements and put the non-essential out of focus. Want to make your Hawaii wedding or reception a memorable one? Consider hiring Plein Air artist Mark N. Brown to create a one-a-kind artwork live, on-site! Mark N. Brown loves canoes and the paddling community in Hawaii. He is often inspired by the wonderful colors of the canoes he encounters and the great community that surrounds him while he paints on site. If you're looking for a unique way to capture your party or special event, then Hawaii artist, Mark N. Brown's live event painting services may just be what you need! Hawaii's premiere plein air artist is proud to support the Camp Mokulē‘ia with an artwork donation. Mark N. Brown is proud to be selected to represent Oahu at the world renown Maui Plein Air Painting Invitational (MPAPI) event. The Maui Plein Air Painting Invitational (MPAPI) is a week long art event in Lahaina on Maui, Hawaii. Every online image purchase (using our safe and secure PayPal shopping cart) will include a FREE frame with your artwork professionally set in the frame. Your artwork will arrive "Ready to Hang".